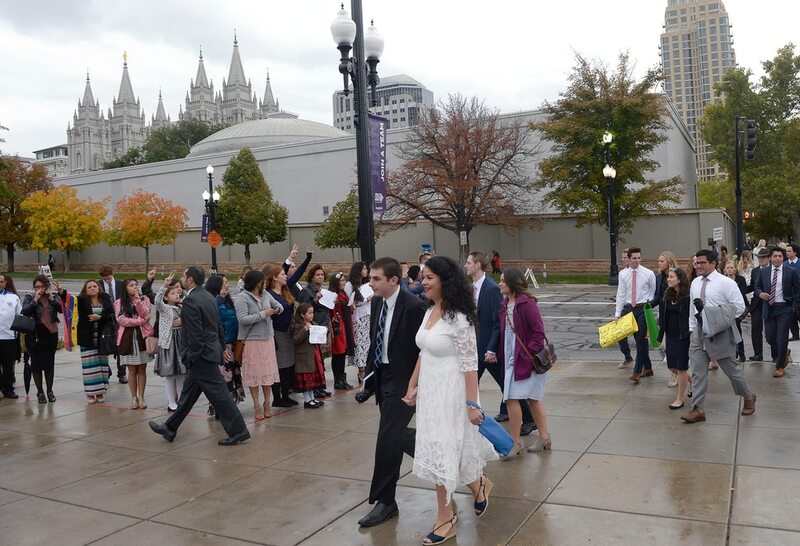 (Al Hartmann | The Salt Lake Tribune) Members of the Church of the Jesus Christ of Latter Day Saints walk to the General Conference Oct. 1 2017. (Al Hartmann | The Salt Lake Tribune) Conductor Mack Wilberg leads the Mormon Tabernacle Choir in song during General Conference Sunday Oct. 1 2017. (Al Hartmann | The Salt Lake Tribune) Members of the Church of the Jesus Christ of Latter Day Saints signal for any extra tickets to attend General Conference Oct. 1 2017. (Al Hartmann | The Salt Lake Tribune) President Henry B. Eyring, center, shake hands with Members of the Qurom of the 12 Apostles at the start of General Conference Sunday Oct. 1 2017. (Al Hartmann | The Salt Lake Tribune) President Henry B. Eyring, waves to attendees of General Conference Sunday Oct. 1 2017. (Al Hartmann | The Salt Lake Tribune) Jean B. Bingham, Relief Society general president, speaks at General Conference on Sunday, Oct. 1 2017. (Al Hartmann | The Salt Lake Tribune) Second Counselor to the First Presidency Dieter Friedrich Uchtdorf leads General Conference Oct. 1 2017. (Al Hartmann | The Salt Lake Tribune) Members of the Church of the Jesus Christ of Latter Day Saints signal for any extra tickets to attend General Conference Oct. 1 2017. (Al Hartmann | The Salt Lake Tribune) Donald L. Hallstrom of the Seventy speaks at General Conference Sunday Oct. 1 2017. (Al Hartmann | The Salt Lake Tribune) President Henry Eyring, first counselor to the First Presidency, center, and President Dieter Uchtdorf, second counselor to the First Presidency, left, wave to those attending the Sunday morning session of the LDS Church’s 187th Semiannual General Conference in Salt Lake City on Sunday Oct. 1, 2017. (Al Hartmann | The Salt Lake Tribune) President Henry Eyring, first counselor to the First Presidency, waves to audience at concusion of the Sunday morning session of the LDS Church’s 187th Semiannual General Conference in Salt Lake City on Sunday Oct. 1. (Al Hartmann | The Salt Lake Tribune) President Henry Eyring, first counselor to the First Presidency, fourth from right,, and President Dieter Uchtdorf, second counselor to the First Presidency, just behind, shake hands with the members of Qurom of the Twelve Apostles at concusion of the Sunday morning session of the LDS Church’s 187th Semiannual General Conference in Salt Lake City on Sunday Oct. 1. (Al Hartmann | The Salt Lake Tribune) President Henry Eyring, first counselor to the First Presidency, left, and President Dieter Uchtdorf, second counselor to the First Presidency, stand for a hymn during the Sunday morning session of the LDS Church’s 187th Semiannual General Conference in Salt Lake City on Oct. 1. 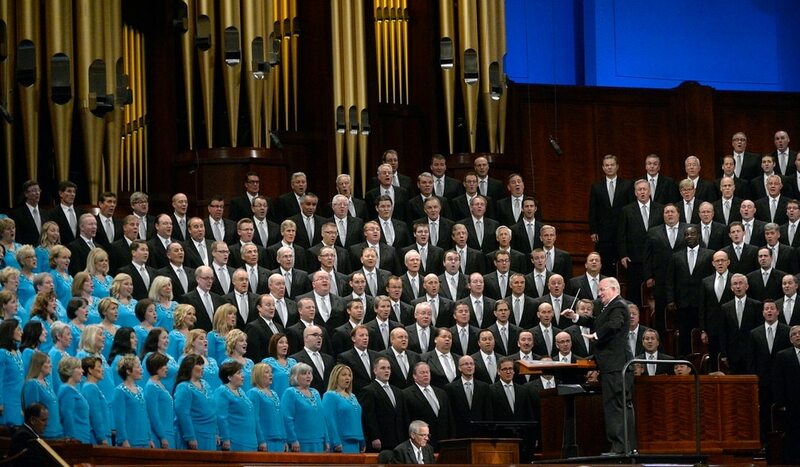 Inbetween them is an empty chair, usually occupied by President Thomas S. Monson. (Al Hartmann | The Salt Lake Tribune) President Henry Eyring, first counselor to the First Presidency, speaks during the Sunday morning session of the LDS Church’s 187th Semiannual General Conference in Salt Lake City on Sunday Oct. 1, 2017. (Al Hartmann | The Salt Lake Tribune) President Henry Eyring, first counselor to the First Presidency, center, and President Dieter Uchtdorf, second counselor to the First Presidency, just behind, shake hands with the members of Qurom of the Twelve Apostles at concusion of the Sunday morning session of the LDS Church’s 187th Semiannual General Conference in Salt Lake City on Sunday Oct. 1, 2017. (Al Hartmann | The Salt Lake Tribune) Conference atendees and members of the Mormon Tabernacle choir relax and eat lunch between sessions of the LDS Church’s 187th Semiannual General Conference in Salt Lake City on Sunday Oct. 1, 2017. (Al Hartmann | The Salt Lake Tribune) Dieter F. Uchdorf, Second Counselor in the First Presidency and wife Harriet wave to crowd at LDS Church’s 187th Semiannual General Conference in Salt Lake City on Sunday Oct. 1, 2017. (Al Hartmann | The Salt Lake Tribune) M. Russell Ballard, Qurom of the Twelve Apostle speaks at the Sunday afternoon session of the LDS Church’s 187th Semiannual General Conference in Salt Lake City on Sunday Oct. 1, 2017. (Al Hartmann | The Salt Lake Tribune) Tad R. Callister, Sunday School General President speaks at the Sunday afternoon session of the LDS Church’s 187th Semiannual General Conference in Salt Lake City on Sunday Oct. 1, 2017. (Al Hartmann | The Salt Lake Tribune) Thousands of members of the Church of Jesus Christ of Latter Day Saints attend the Sunday afternoon session of the LDS Church’s 187th Semiannual General Conference in Salt Lake City on Sunday Oct. 1, 2017. 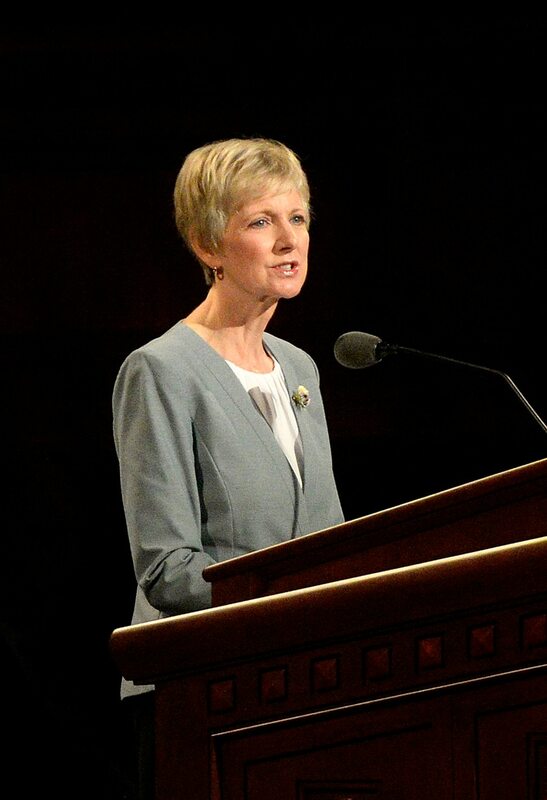 After describing the heroic life of black Mormon pioneer Jane Manning James, LDS apostle M. Russell Ballard told a worldwide audience of Mormons on Sunday that bigotry in any form is un-Christian. The conference’s final day began without the presence of the church’s ailing 90-year-old leader, President Thomas S. Monson, who did not attend any sessions of this fall’s twice-yearly gathering. It marks the first time that has happened during Monson’s nearly 10-year tenure as leader of the nearly 16 million-member Church of Jesus Christ of Latter-day Saints. Shortly after the morning session, longtime apostle Robert D. Hales died at a nearby hospital. The 85-year-old leader, who had been in failing health for several years and was unable to attend this conference, was being treated for pulmonary conditions and other health issues. Henry B. Eyring, first counselor in the governing First Presidency, noted Hales’ passing at the start of the afternoon session. Going off script, apostle Neil L. Andersen noted in his concluding speech that the First Presidency had offered to let Hales speak Sunday — if he were up to it. Though he was unable to do so, the late apostle did pen his thoughts, which he gave to Andersen to read. 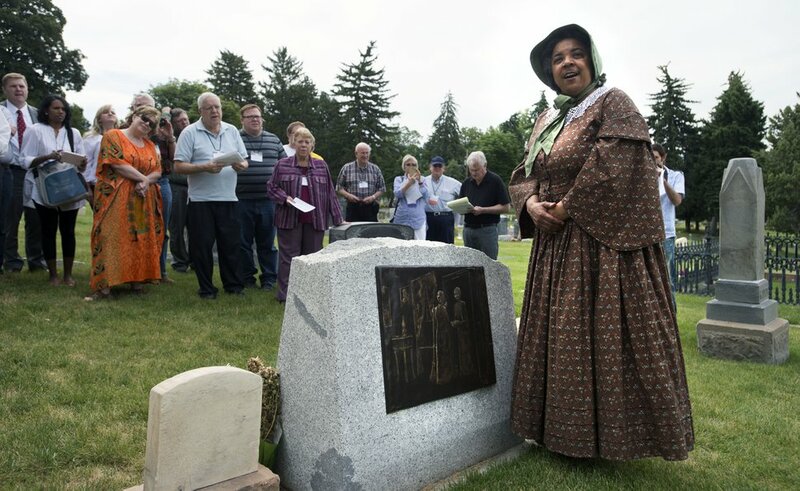 Steve Griffin / The Salt Lake Tribune Jeri Harwell, dressed and acts in character as Sister Jane Elizabeth Manning James as she tells her life story at the grave site of the historical African-American Mormon woman at the Salt Lake City Cemetery Thursday June 9, 2016. The event was part of a tour in conjunction with the Mormon History Association conference that visited significant sites and stories related to African-Americans in Utah history. As a black member, James was denied access to Mormon temples — despite her pleas to perform the faith’s holiest religious rites there. The LDS Church’s ban preventing black men and boys from being ordained to its all-male priesthood and women from entering its temples didn’t end until 1978. Through it all, though, James did not stop believing. Though Ballard did not mention any group by name, the characterizations seem to fit the nascent Remnant movement, based in part on divine revelations asserted by excommunicated Mormon Denver Snuffer, a Sandy attorney. The movement, which reportedly has between 5,000 and 10,000 members, teaches that Mormon founder Joseph Smith was a “true prophet,” but all subsequent LDS leaders, starting with Brigham Young, fell away from the truth. During the morning gathering, Eyring mentioned Monson’s brief remarks at the April conference, during which the frail LDS prophet-leader encouraged all members to read the faith’s signature scripture, the Book of Mormon. He pointed to the widespread service of Latter-day Saints who partnered with other churches, community groups and national organizations to begin cleanup efforts in the aftermath of recent hurricanes in Puerto Rico, St. Thomas, Texas and Florida. (Al Hartmann | The Salt Lake Tribune) Jean B. Bingham, Relief Society general president, speaks at General Conference on Sunday, Oct. 1 2017. Apostle David A. Bednar discussed the ways in which honoring the sabbath and attending an LDS temple are similar. W. Craig Zwick, a newly named emeritus general authority, urged Mormons to see others through the eyes of Jesus. He told the story of a young Mormon missionary in his charge who repeatedly asked to go home. Zwick, as mission president, just kept lecturing and challenging the young man to study and work harder, but the young man’s resolve to leave did not change. Zwick felt horrible about misunderstanding the missionary.